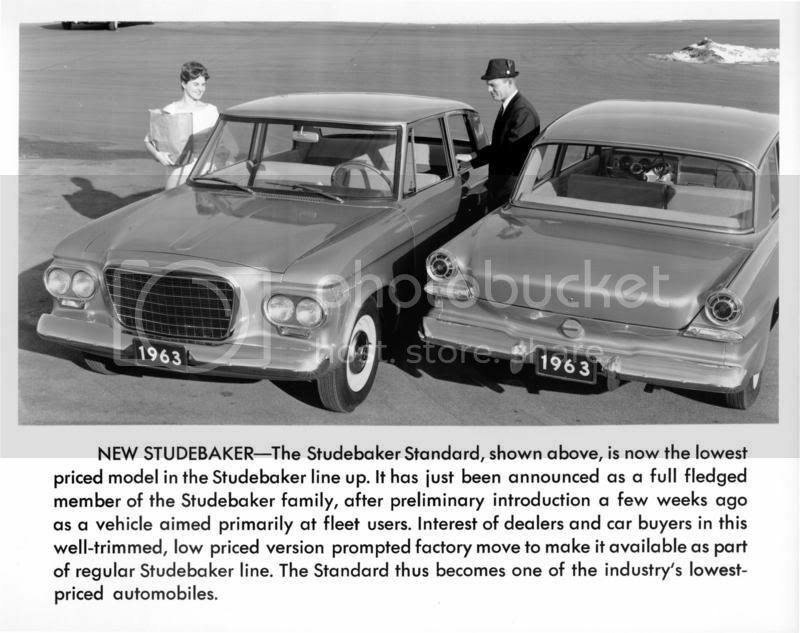 Whilst trolling the 'net, I came upon an auto lit vendor offering an original Studebaker press package on the announcement of the '63 ½ Studebaker Standard, complete with glossy 8x10" photo and accompanying slug line. I've found out a lot of Standard-related info lately. The car was a mid-year introduction, basically a last-ditch effort at capturing more sales ('63 was a terrible year for Studebaker sales; it's arguably the straw that broke the camel's back for the Stude board of directors) from the lowest possible stratum of auto buyers. Deletion of all side and trunk-panel trim. Regular Larks had the word "L A R K" in individual letters on the front fenders; on the Standard it was replaced with "Studebaker" script that dated back to 1956. The stainless steel dress-up trim was omitted from the trunk lip and the individual letters that spelled out "S T U D E B A K E R" were left off the trunk as well as the emblem that would have adorned the top of the trunk lid. In the front, the hood ornament was deleted, as was the small badge at the lower right corner of the grille that denoted a V8 or Six engine choice. The insulating pad was not installed under the hood, and only one horn - the high voice - was installed. Inside, the changes were abundant. There were no carpets, just a rubber floor mat; an armrest and sun visor were provided for the driver only. The horn bar was replaced by a horn button only. There was no cigarette lighter or ashtray. Upholstery was all-vinyl, with a very plain pattern on the door panels and seats. Even the courtesy light that would normally illuminate automatically when the doors opened was replaced with a manual lamp - they left out the door switches! The biggest change in the interior was the removal of the swanky Vanity glovebox with pop-up mirror that other '63 Larks had; instead, Standards came with a vinyl-covered cardboard "mailbox" bolted in its place. Nasty. All brightwork was omitted from the windows - no stainless around the front or rear windows, on or on the door window frames. Straight-six with column-shifted 3-speed was the standard mill. Although the lenses for backup lights were installed, the lights themselves were optional. Most Standards had no sockets inside those housings! In spite of this austerity, nearly everything could be added optionally. Side-view mirrors, passenger's arm rest and visor, clock, b/u lights, windshield washer, Climatizer (Studebaker's temperature-maintaining heater system), etc. could be specified. You could upgrade the powertrain too; the only two options my car was delivered with were the 259 V-8 and the Flight-O-Matic 3-speed automatic trans. There are even some documented R-Series Standards; there's a well-known red 63V F2 (2-door sedan, the lightest body style) that was ordered with the R-2 Jet Thrust supercharged engine and Power Shift automatic! Somewhere in my Standard's history, a previous owner decided to upgrade it, keeping the original engine and transmission but bolting on a 4bbl carb from a '57 President, adding dual exhausts, and swapping in a Twin Traction limited-slip rear axle, as well as reupholstering the interior. I'm looking forward to running it as the ultimate sleeper! I know this isn't Studebaker related, but indulge me please. On Sunday morning, my Sydney passed away from liver cancer. Surgery five days prior found she was riddled with it... she'd shown no symptoms, even though the vet figured she'd had it for months. We hoped she'd recover enough to be with us for a few more weeks at least, but her liver failed a couple of days post-op. With her breathing coming harder all the time, refusing to eat and finally even to drink, I drove her to the animal ER at 2AM on 10/7 and let her go. Syd was a wonderful, gentle, loving girl, and we miss her terribly. We saved her from the pound, so each day was precious to her. I've been carrying her collar in my pocket for days. We were blessed by her love for just five years, and I thank God for every minute.